Betsy Garcia captured the feeling after 2017's Women's March the best way she knew how: through her art. "We hope this print reminds women that we are in this together," says Betsy Garcia, "and that this IS just the beginning." After 2017's Women's March, she wanted to capture the feeling felt by women around the world the best way she knew how: through her art. With a pastel color palette and a playful illustration style, she's created a piece that's equal parts sweet and statement-making. 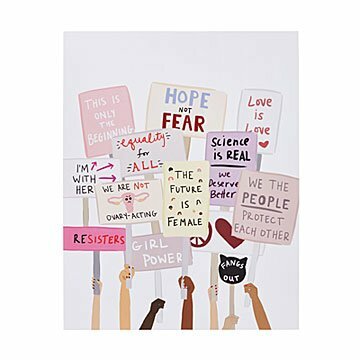 Give this digital print to the person who believes in equal rights for all—and that you can be feminine and feminist. Made in Orlando, Florida. Betsy Garcia is a self-taught artist who started her illustration and paper goods studio after foregoing plans to become a doctor. With the support of her husband, Luis, and no formal art training, she began illustrating in her free time after graduating from college. It renewed her passion for art, and inspired her to follow her childhood dream. Now, Betsy illustrates and creates full time in her Orlando, Florida studio, always striving to use her artwork to send messages of hope and happiness.